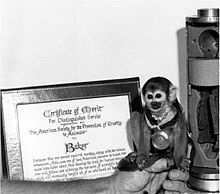 Miss Baker (1957 – November 29, 1984) was a squirrel monkey who in 1959 became, along with rhesus macaque Miss Able, one of the first two animals launched into space by the United States and safely returned. Previous United States efforts at launching monkeys to space had met with the animals' demise from suffocation or parachute failure, and Soviet Union efforts had fared little better, to the chagrin of animal rights activists. The Soviet Union had recovered two dogs, the first mammals to be recovered from suborbital space flight, from an altitude of 101 kilometers (331,000 ft) on July 22, 1951 and subsequently recovered more dogs. The United States had flown monkeys and mice by Aerobee rocket to heights below the edge of space beginning in 1951. The squirrel monkey who was to become known as Miss Baker was purchased along with 25 other squirrel monkeys at a pet shop in Miami, Florida, and brought to the Naval Aviation Medical School in Pensacola. Fourteen of the candidates tolerated confinement for periods up to 24 hours, electrodes all over their bodies, and monitoring at all hours. Miss Baker "stood out from the rest because of her intelligence and loving, docile manner", relayed Colin Burgess and Chris Dubbs in their 2007 book ‘Animals In Space: From Research Rockets to the Space Shuttle.’ For this, and her apparent pleasure at being handled with tender loving care, she earned the nickname TLC. With experiments imminent, the Army named their monkey "Alpha," and the Navy followed with "Bravo," names taken directly from the phonetic alphabet. Before flight, though, the names changed to the first letters of the antiquated Joint Army/Navy Phonetic Alphabet. Jupiter AM-18 stands ready for its 2:39 am launch at Cape Canaveral launch complex 26B. Miss Baker wore a helmet lined with rubber and chamois leather plus a jacket for launch, in addition to a respiration meter affixed to her nose with model cement, and she was fitted into a snug capsule of shoebox size, 9¾ × 12½ × 6¾ inches (24.8 × 31.8 × 17.1 cm) insulated with rubber and fiberglass. Life support was an oxygen bottle with a pressure valve, and lithium hydroxide to absorb exhaled carbon dioxide and moisture. 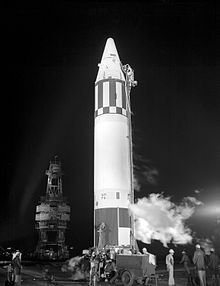 On May 28, 1959, at 2:39 am, a Jupiter rocket lifted Miss Baker and Miss Able to an altitude of 300 miles (480 km) through an acceleration of 38 gs for a 16-minute flight which also included 9 minutes of weightlessness. The flight traveled 1,500 miles (2,400 km) downrange from the pad at Cape Canaveral launch complex 26B to the Atlantic Ocean near Puerto Rico where the capsule was recovered by USS Kiowa. The following table shows some characteristics of the monkeys on Jupiter AM-18 and the measurements taken during flight. Some of Able's measurements had data problems as indicated. Able and Baker were not alone on the flight. They were accompanied by Neurospora; samples of human blood; E. coli; onions; mustard and corn seeds; Drosophila pupae; yeast; and sea urchin eggs and sperm. Able died four days after the flight from a highly unusual cardiac fibrillation in reaction to anesthesia to remove electrodes. "This is the type of anesthetic death every surgeon fears," said Colonel Robert Hullinghorst, deputy at Ft. Knox where the surgery took place, "We don't know exactly why it occurs." An autopsy found no problems that may have contributed to her death. Able is stuffed and on display at the National Air and Space Museum. The ASPCA awarded Miss Baker with a Certificate of Merit for Distinguished Service, supporting "'carefully controlled scientific' use of animals as space pathfinders for the 'mutual benefit of man and animals.'" Miss Baker's birthdays were marked by balloons and some of her favorite foods. Owing to their successful return from space to the USS Kiowa (ATF-72) and their crew, Able and Baker appeared on the cover of Life magazine, June 15, 1959. In 1962, Pensacola caretakers held a marriage ceremony to wed Miss Baker to Big George. Miss Baker lived at the Naval Aerospace Medical Center in Pensacola, Florida until 1971. In 1971, Miss Baker moved to the U.S. Space & Rocket Center in Huntsville, Alabama, where she entertained museum visitors and drew 100–150 letters a day from schoolchildren. The 1977 birthday celebrations brought balloons, camera flashes, and the regular fare of cottage cheese for Miss Baker and Big George. Big George predeceased Miss Baker on January 8, 1979, and three months later, Norman, from the Yerkes National Primate Research Center, became her second mate in a ceremony presided over by Alabama District Court judge Dan McCoy. Miss Baker refused to wear her white wedding train for the event, tearing it off after a few seconds. In 1982, center director Ed Buckbee said, "Baker delights visitors every day with her energy and antics with her husband Norman." Her birthday was celebrated within a few weeks of the actual day, on the anniversary of her flight, May 28 each year. In celebration of the 25th anniversary of her spaceflight, Baker was treated to a rubber duck and, her favorite, strawberry gelatin with bananas, along with well-wishes from thousands of people. Miss Baker's gravestone frequently has one or more bananas on top. In 1984, Miss Baker died of kidney failure at a clinic at Auburn University after attaining the record for oldest living squirrel monkey. She is buried on the grounds at the U.S. Space & Rocket Center. Her tombstone routinely has one or more bananas on top. Wikimedia Commons has media related to Miss Baker. ^ "V2". Astronautix. Archived from the original on September 6, 2008. Retrieved September 14, 2011. ^ a b c "1959: Monkeys survive space mission". BBC News. Retrieved September 14, 2011. ^ Asif. A. Siddiqi (2000). Challenge to Apollo: The Soviet Union and the Space Race, 1945–1974 (PDF). NASA. p. 95. ^ "Animals in Space". NASA. Retrieved October 9, 2011. ^ a b c d e f Burgess, Colin (2007-07-05). Animals in Space: From Research Rockets to the Space Shuttle. pp. 134–141. ISBN 9780387496788. ^ a b c Beischer, DE; Fregly, AR (1962). "Animals and man in space. A chronology and annotated bibliography through the year 1960". US Naval School of Aviation Medicine. ONR TR ACR-64 (AD0272581). Retrieved June 14, 2011. ^ a b c Greenfieldboyce, Neil (May 28, 2009). "After 50 Years, Space Monkeys Not Forgotten". Retrieved September 14, 2011. ^ "Jupiter". Archived from the original on October 10, 2011. Retrieved September 15, 2011. ^ "Figure 8". Retrieved September 14, 2011. ^ "NASA marks 50th anniversary of monkeys Able and Miss Baker in space". The Huntsville Times. May 28, 2009. Retrieved September 14, 2011. ^ a b "Space Monkey Marks Birthday". Tuscaloosa News. June 30, 1977. Retrieved September 14, 2011. ^ "Monkey Baker is Honored by ASPCA". The (Lexington, North Carolina) Dispatch. June 30, 1959. Retrieved September 15, 2011. ^ Windham, Kathryn Tucker (2007). Alabama, One Big Front Porch. NewSouth Books. p. 168. ISBN 9781588382191. ^ a b c d "Little Miss Baker Back in Spotlight". Tuscaloosa News. May 28, 1982. Retrieved September 14, 2011. ^ 20th Anniversary U.S. Space and Rocket Center. USSRC. March 17, 1990. ^ "Monkeys Wed at Huntsville". Rome (Georgia, U.S.) News-Tribune. April 11, 1979. Retrieved September 14, 2011. ^ "Miss Baker A-OK". (Florence/Sheffield/Tuscumbia/Muscle Shoals) Times Daily. May 29, 1984. Retrieved September 14, 2011. ^ "Memorial Set for Miss Baker". (Florence/Sheffield/Tuscumbia/Muscle Shoals) Times Daily. December 2, 1984. Retrieved September 14, 2011. ^ "The Grave of Miss Baker, Huntsville". 30 Amazing Hidden Gems in Alabama (The Crazy Tourist).